In this respect, we can recall how Singapore has muscled its way into creating an art environment. 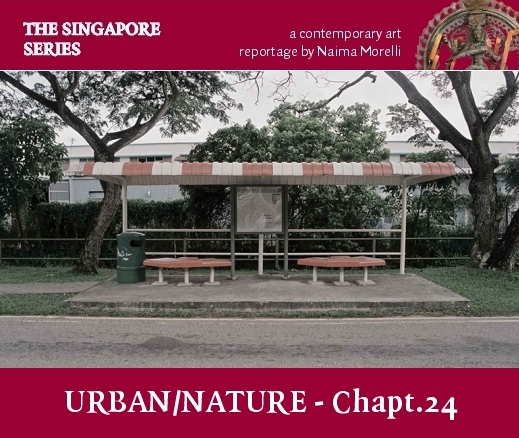 In a similar way, nature has been artificially modified in Singapore since the ‘70s, when the government started presenting Singapore as a “Garden City”, later to be rebranded as “City in a Garden”. Instead of stripping down the unessential to get to the roots, the whole City in the Garden project has been about recreating a sort of “post-nature” – completely artificial. We can leave the technical details of its sustainability and effects to the experts. What we will do in this chapter is observe how this way of working corresponds to what is happening in the art system, and how in its own way it is influencing it. The work of Perception3 was compelling to me, because although it is very Singapore-specific – many works present local tropes, like void decks and escalators – it also uses universal symbols and metaphors. The idea of memory and place is a recurrent theme in their work. For the artists, the documentation of space becomes the marker of their memories. “When we look at a particular space, we don’t see space itself but we see the memories of it. What happened there.” they noted. Before their video-work,the artists started off by taking photographs. To them, the act of taking a photograph was a compulsion to document. This to them is driven by the fact that they instinctively know how fleeting and ever-changing the spaces in Singapore are. Text was later added to the final work – a short 1 minute piece – to create a juxtaposition, as the text didn’t always align with what the viewer saw. This was meant to bring the viewer on another journey. In the first chapter, we asked ourselves what is a place, and we thought about it something more than a backdrop against which the human comedy unfolds. It is rather something created as it is perceived. Shaped by how it is remembered. It ultimately takes different forms and meanings according to our imagination. We also saw how imagination and rules fight against each other as two polar forces, and in the midst of this battlefield societies are situated. Now we will observe more in specific how space itself modifies according to these two kind a of perceptions: a bureaucratic perception versus an imaginative one. The end point will be trying to take as much as possible an outlook which is beyond these two cultural categories, their means and ends. Nature, as a force and foundation, is brought into the picture. Let’s start with imagination. In order to understand space as a place influenced by our fantasies and expectations, we must go back to a basic human act, which translates today in the most sought-after dream for both convinced shopaholic consumerists and adventurous hippie minimalists alike: travelling. Think about it: when we travel to countries which, just like everything in the world, offer a variety of aspects and facets to look at, we just turn our cameras to what we deem to be the local, the different, the specific. We think the opposite of Andy Wharol, who famously said that the most beautiful thing in Tokyo is McDonald’s, the most beautiful thing in Stockholm is McDonald’s, the most beautiful thing in Florence is McDonald’s, “and Peking and Moscow don’t have anything beautiful yet.” He couldn’t have defined globalisation any better. Indeed, the massive uniformity in modern cities that was just starting out on in the heydays on Wharol. But of course, it’s not just about multinationalism per se. In our perception while travelling, it has a lot to do with architecture. The pastel-coloured small houses in Procida, Italy, had a consistent style with smoothed corners. This was not because they wanted to give a specific identity to the place, hoping to attract tourists. The reason was rather the scarcity of materials and “imagination” – they couldn’t even think of Swiss cottages, because local fishermen building their own houses never saw it on television. Because of course back then, there was no television. Furthermore, what would be the point of building pointed roofs, if heavy rains were only a secondary occurrence? In Mediterranean climates, flat or rounded roofs are what is needed. In contemporary times, the way we conceive our houses and our cities is influenced by an abundance of choices. We have already seen that human beings tend to not to be moderate when confronted with too much choice. When actual materials and imagination become virtually limitless, when function is not seen as central to buildings, people and their architects start going crazy. So places like Orta di Atella, Italy, become possible. Orta di Atella is a small town in Hinterland Naples, where my diabetologist lives. I’m originally from Sorrento, a place which is not too far from Orta di Atella in terms of kilometres, but still, the one-hour drive feels like hyperspace travel. The tiny town centre still had some sparse remnants of its rural past: run-down beautiful churches to old houses with big doors, reminiscent of the agricultural economy which used to be the main economical resource. In the last ten years, the town has had a residential sprawling. Housing has started becoming pivotal in the city’s economy, transforming the town into a strange creature. Killing time before the appointment with the diabetologist, my father and I decided to explore the neighbourhood, and we were reminded of the terrifying power of architects. You could turn your face away from a painting if you don’t like it, but you can’t turn your face to architecture. A building is there and you can’t do anything about it. In Orte di Atella, each one of those houses with a bit of garden framing on them were all dramatically different from each other. The aesthetic clash was highly disturbing. You turned to your right and you had a Swiss cottage, you turned to the left and you had a Bauhaus-style building, you looked in front of your and you had a neoclassical fake-marble villa and you turned around and you have a concrete pre-fabricated from the ‘70s. Pure Disneyland. Don’t get me wrong, I still believe that imagination and democracy are worth fighting for. But of course, high values need people with an ethical and aesthetical education to be used wisely. In our freedom, when we take decisions, we can know these are not guided by superficiality or by bad taste. Orta di Atella is an example of what happens when you let people without any kind of visual education wildly unleash their imagination. You feel like you’re walking into a Luna park. Which is fine for a day, but surreal if this becomes your everyday reality. I was in Naples, but I could have been anywhere in the world. Never as in time of globalisation taste is necessary. Unless of course, you have a taste for the tasteless – as a personal preference that might work, but I personally don’t wish this for an entire society. From a phenomenological standpoint, the question was well beyond the mere aesthetic. What the town mirrored was the lack of a collective imaginary. It was the mirror of an individualistic society, where no one cared to have anything in common with their neighbour, but was rather actively working to be grander. Architecture was indeed a mirror – or a consequence – of how people would come or not come together. So what came first? The way people came together or the construction of places? Again it’s osmotic, and it is grassroots – just like it would be a Kampong in old Singapore. Would a top-down approach like the one of the new Singapore work better in a place like this? It would be rational and logic to think so, but it is also true that what works on the board doesn’t necessarily work for the people in real life.